﻿ Cat Lovers: Don't Miss These Cat Places in Japan! Cat Lovers: Don’t Miss These Cat Places in Japan! It’s not a secret that I’m a huge cat lover. Are you one, too? 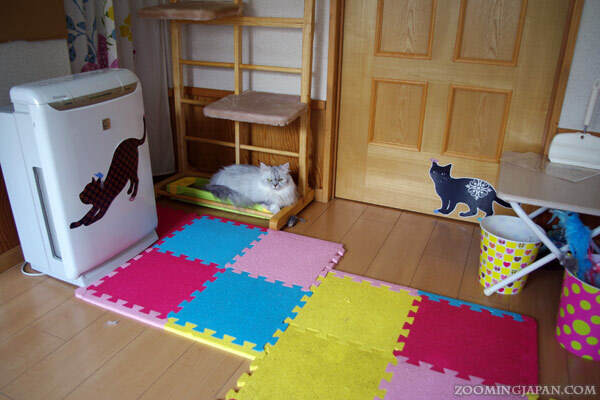 There are many awesome cat places in Japan I want to introduce to you today. You absolutely can’t miss them if you’re visiting Japan! You might have heard about Maneki Neko, Cat Cafés …. and maybe even Cat Island?! 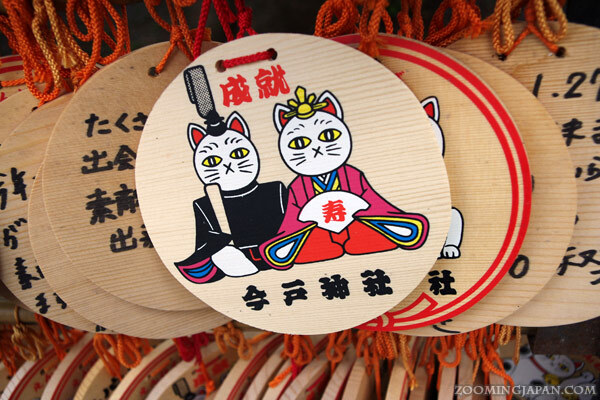 In this blog post, you’ll find everything your cat loving heart needs for a great vacation in Japan. I’m sure most of you have heard of “cat cafés” these days. They’re huge here in Asia, but I read that there are some in Europe as well. Basically, it’s meant for people who cannot have a cat at home for whatever reason. 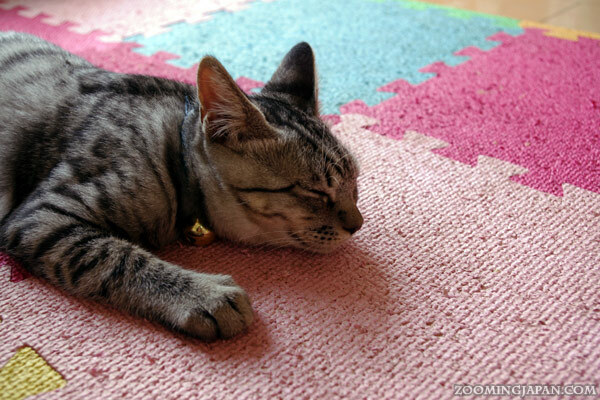 You can go to a so-called cat café and just hang out with cute kitties – for a small fee. You can play with them, pet them or just enjoy a cup of tea while watching them sleep. 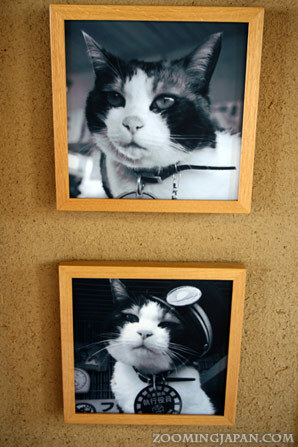 I miss having a cat here in Japan, so I often check out cat cafés when travelling. If you want to find a cat café nearby, check out this awesome map. It’s in Japanese, but I’m sure it’s useful even if you can’t understand everything. There’s a huge variety of cat cafés. Some only have black cats, others only Scottish fold ones. Most of the cafés I’ve been to had a good mix of age, gender and breed, though. There’s only one way to find out if a cat café is for you: Go and check one out! 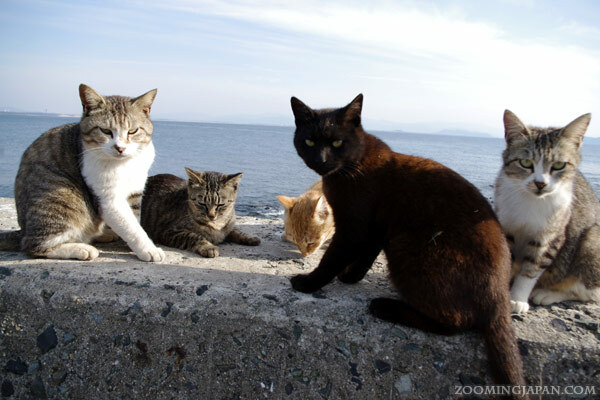 Some of you might have heard of “Cat Island Japan” assuming there’s only ONE such island. Well, the most famous one – and it’s also what pops up when you search for it on Google – is without a doubt: Tashirojima. I’ve been there and I highly recommend going. 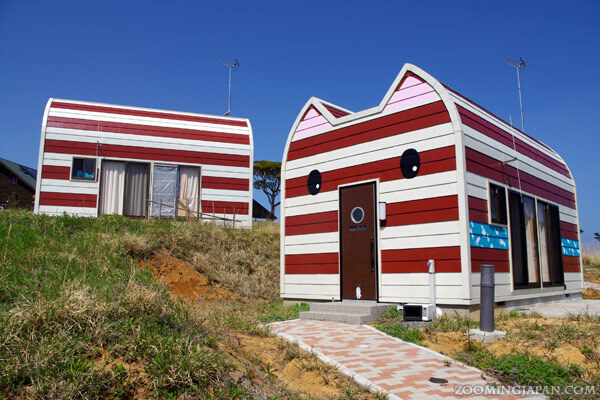 You’ll find not only cats, but also awesome cat lodging buildings. However, Tashirojima is quite far out – and if you’re not near Tokyo, you might prefer another one. Good news, there are enough cat islands around. You just gotta know where to look for them. Another one I’ve personally visited and thus can recommend is: Ai(no)shima Island (相島) in Fukuoka Prefecture. It’s very close to Hakata Station, so it can be easily accessed. Get off at Nishitetsu Shingu Station. From there it’s a short walk and a 20-minutes ferry ride. 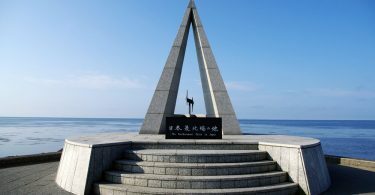 Ainoshima (藍島, Fukuoka Prefecture) – not the Ainoshima (相島) in Fukuoka I’ve been to! See also here or if you understand Japanese then this is the best overview of cat islands in Japan. 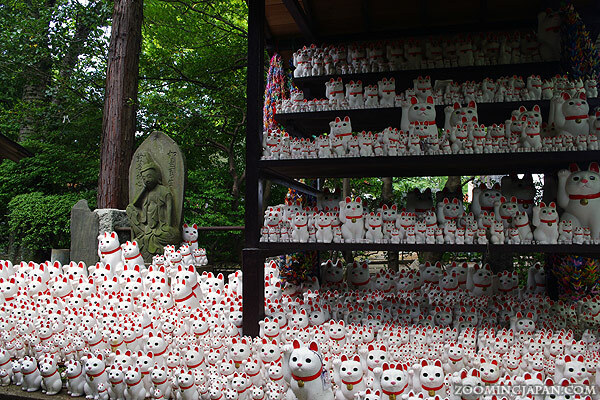 Less exotic than the cat islands and much easier to access are cat shrines or temples. There are quite a lot of them – but you need to know where to find them. They’re usually very small and hidden in the inaka (*Japanese countryside). 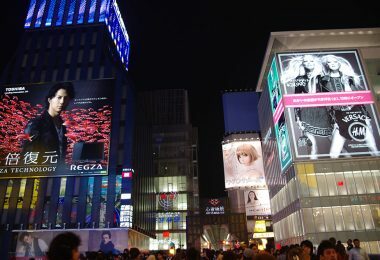 But there are two awesome ones in Tokyo, so everyone who’s interested can easily check them out. 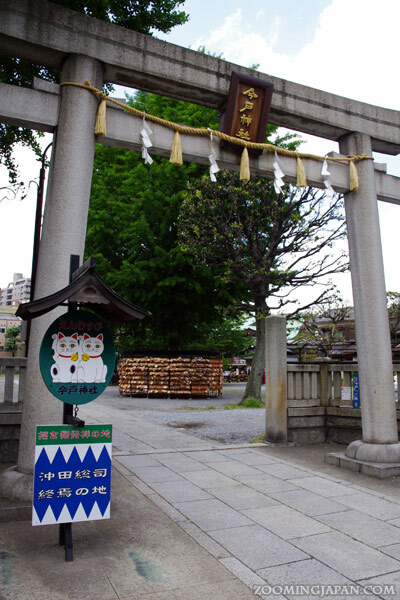 The first one is Gotokuji Temple (豪徳寺) in Setagaya. Just get off at “Gotokuji Sta.” and from there it’s a 15-minutes walk. Maybe a bit tricky to find, so either ask around or use Google Maps. Maneki Neko, the cat that is beckoning good luck. You all know the cute figures that you can find in front of restaurants or shops. However, a legend says it goes back to this temple. 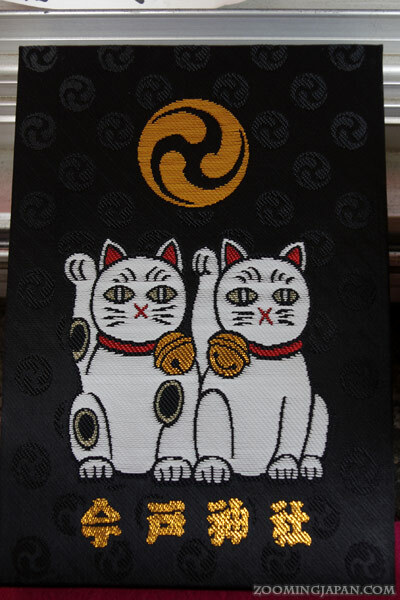 In the Edo period, a feudal lord from Hikone (Shiga Prefecture) visited the region and was lured into the temple by a cat. Otherwise he probably would have passed and walked on. A heavy thunderstorm started shortly after he had entered the temple. He was really thankful that the cat made him choose to visit the temple instead. Even nowadays people present a maneki neko figure to show gratitude for wishes that were granted. 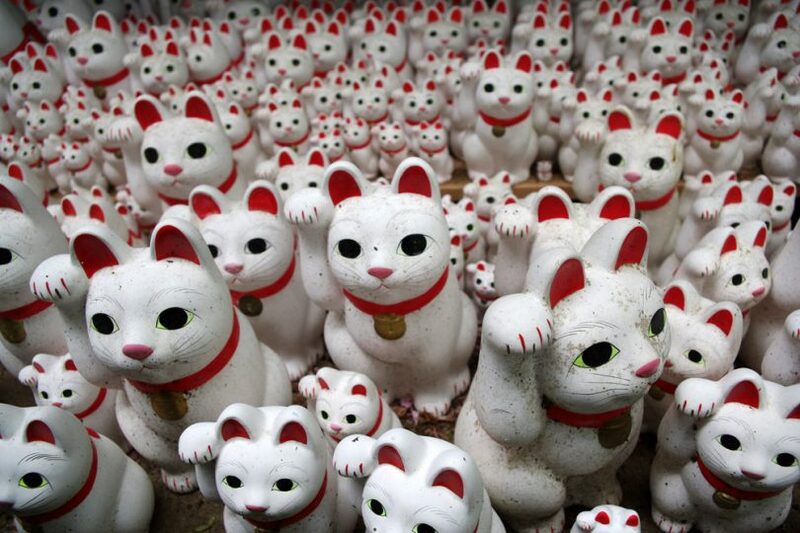 That’s why you’ll find so many maneki neko figures there. It’s really quite impressive. Of course, there are ema as well. I couldn’t resist and had to buy a few (as souvenirs). 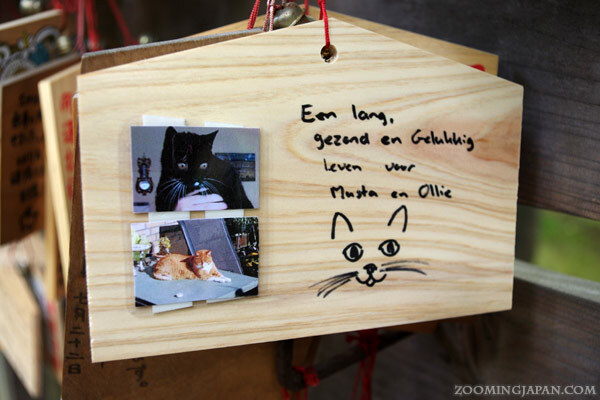 But as you can see, people from all over the world made wishes for the sake of their cats. 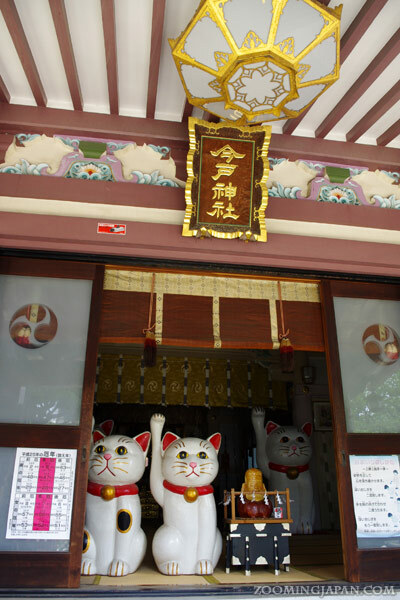 Another cat place in Japan to check out is Imado Shrine (今戸神社) located in Asakusa. It’s not too far from all the popular tourist spots in Asakusa such as Sensoji Temple. You can get off at Asakusa Sta. (Ginza Line) and then walk for about 15-20 minutes. 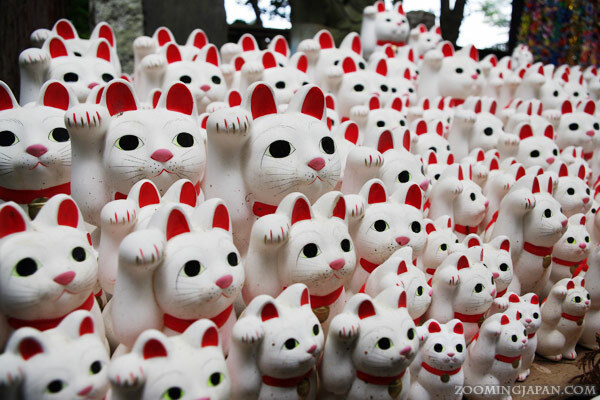 It’s not as impressive as Gotokuji Temple, but they have nice maneki neko figures as well. 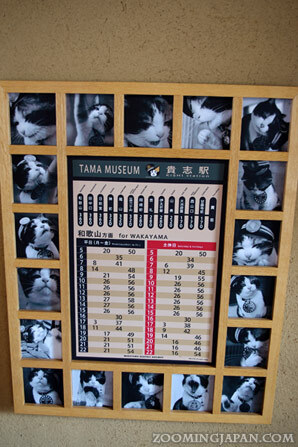 You can even buy a lovely cat shrine seal book there. I did. 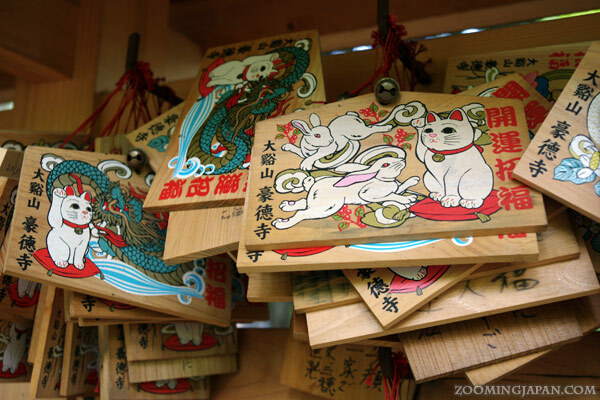 The cute ema of Imado Shrine. 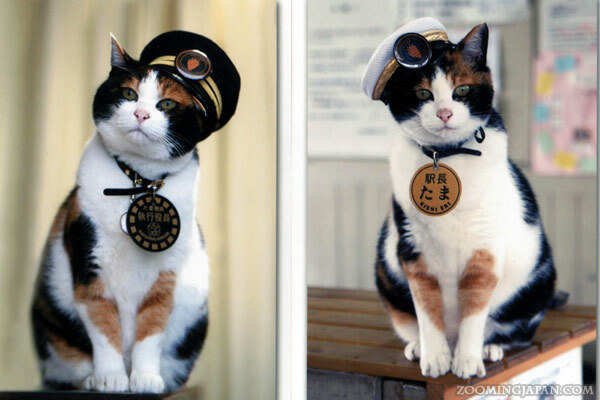 Not everybody has heard of Tama, the feline station master yet – although she’s so lovely in her uniform! To be fair, it’s a bit far out. 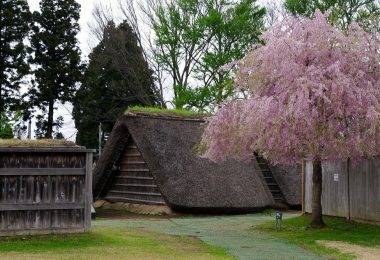 I recommend visiting Tama when you plan a day trip to Wakayama City – or any other place nearby. Tama is “in charge of” Kishi Station, so that’s where you’ll have to get off. The station building has the shape of a cat head and is really adorable. There’s also a “Tama Train“, but it only runs a few times, so be careful. Tama’s only in her uniform for special occasions, so you’ll probably meet her in a more casual fashion. Most likely she’s sleeping. 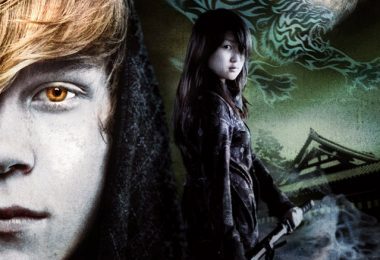 Read more about Tama in a previous blog post. 5. Other Opportunities: Cat Places in Japan are Everywhere! 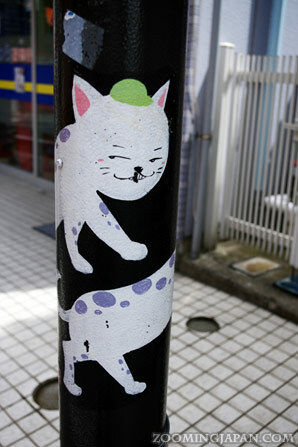 It’s really not hard for cat lovers to run into cat-related things in Japan. Cats are cute and Japan loves cute things, right? 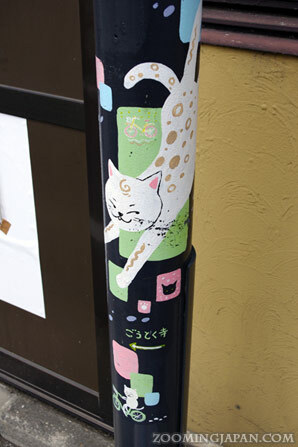 You’ll find a lot of items with cat prints, Maneki Neko figures, Hello Kitty* …. you can even get cats in your coffee! I often run into lots of cats when travelling and later forget about it again. What I can recall right now – and what I would highly recommend: Onomichi and most of the smaller islands on Okinawa, but especially Taketomi. I also recommend parks as there often are a lot of stray cats. If you can, bring some cat snacks for the little ones. They’ll be super thankful. If it’s a park without a major tourist attraction, the cats usually don’t get that much food. Elderly locals sometimes feed them, though. 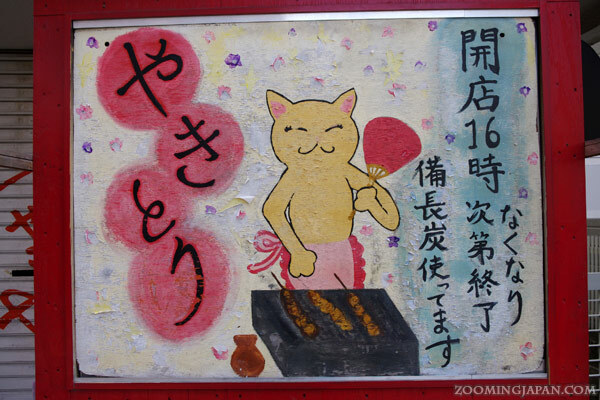 Have you found any awesome cat places in Japan? Please share them with us in the comments below. And, let me know if you have any questions. 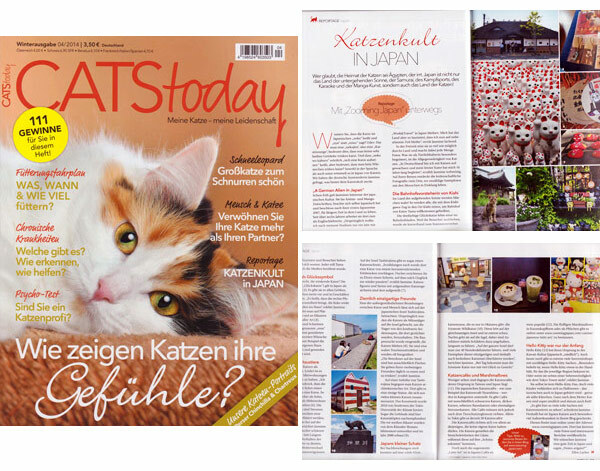 I just quickly want to announce that a cat related article with my photos and an interview with me has been published in a German cat magazine called “CATS today“. The name of the article is called “Cat Cult in Japan“. If you happen to live in Austria, Germany or Switzerland you can purchase it. It’s the winter issue 2014. Great article. :-) I missed the cat-cafes last time i was in Japan because i just did not have enough time but i definitely will visit one the next time. One thing to check though if people are going to visit Tama the station master is to see if she is actually on duty. Since she is getting a bit older, she only is at the station for a couple of days each week. I went there without checking and she was not there. :-( Luckily they have an assistent called Niitama at Idakiso Station who is on duty when Tama is relaxing, but it’s worth checking beforehand to avoid disappointment. Yes, that’s absolutely right. Thanks for mentioning it, Patrick. Tama is getting old and has had other assistants in the past and I’m sure there will be a successor as well. When I visited she still seemed to be on duty a lot more than nowadays. Hm. I’ve travelled around quite a bit here in Kansai, but I’ve never seen any cat shrines or temples (although I’m sure there should be a few).